It has been speculated that a total of about 36 Litestars and 326 Pulse vehicles were built. As of Nov. 2010, 204 vehicles of this marque have been located and included in this list. If you know of any Litestar or Pulse vehicles, please e-mail the vehicle number and owners name to be added to the list, Free of Charge. Produced by Wellbuilt Inc. a subsidiary of Scranton Mfg. Co.
Scranton, Iowa....produced at their Carroll, Iowa plant. Tomorrow Corp. through Wellbuilt Inc. (Scranton Mfg.) built 15 Litestars. It is believed that these units were called 'Pre-Production' units and were promised to dealers to be used as demonstrators. They were built with Hondamatic 450cc engines. The Scranton control number is either painted on the main tube located between the drivers legs or on the frame. The Title of the Litestar usually has the last three numbers such as: VIN #.......100 ---- This is Litestar #001. However, some VIN numbers are completely different than other VIN numbers of these 15 Litestars, so it can be confusing. 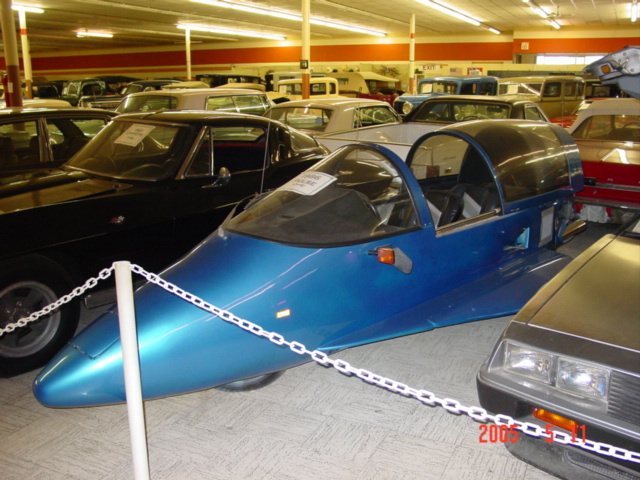 The fiberglass bodies were numbered on a label attached to the inside of the body by its' manufacturer, ETM. Enterprises of Grand Ledge, Michigan. David Vaughn of Owosso, MI had the bodies made and shipped to Iowa. Scranton Litestar #008 with Scranton control #8?.....WHITE?........ Year...1983-84.....Sam Renauro......? March 19, 1984..........Stan Leitner and Jim Bede travel to Japan and meet with with Fujino Industries. They agree in principle to the basic terms of a subcontract agreement subject to Fujino's costing of the vehicle. A Scranton built Litestar was sold to them for $11,300.00. Fujino paid $14,000 to have it air freighted to Japan. Fujino never built any autocycles for Tomorrow Corp. The Litestar that they bought is still in Japan.? According to Owosso Motor Car Co. President Ed Butcher, Tomorrow Corp.'s only 'investment' in OMCC was the payment for the following 21 Litestars, which were delivered. Body #.....This is the Body Number that is typed on a Nero Plastics business card and lamentated into the inside of the body panel as a control number. WARNING - These are not always in order and only bodies #1 thru #218 have a body number attached to a vehicle. After #218, no numbers were issued to a Pulse body. Owosso Litestar #004.....Year 1985.....White.....Rose Marine - Sam Shipley - Tom Harris - Ed Smith....Mike Rosinbaum.... Terry Grogan - TN.....Chuck Furgason - MI and Steve Schmidt.......Sid Horman - Salt Lake City, Utah.....Nancy & Walt Crompton -San Francisco, CA. 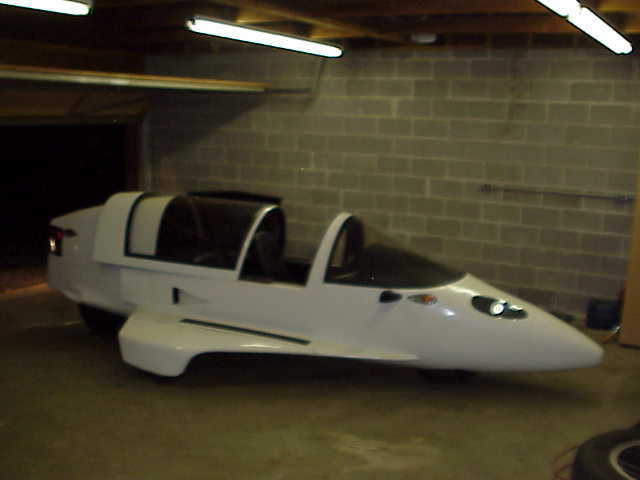 Tom Caprioli's Litestar (Could have been built by the California company owned by Henry Coppola and Dan Willis. Or most likely could be Owosso built Litestar #7 or #19. Produced by Owosso Motor Car Co.
Owosso Motor Car Co. built 326 units. The month and or year date is the final inspection or ship date of the vehicle. Note: Vehicles built between August and December 1985 may be called 1986 models, etc. Most Pulses left the factory with new Yamaha 400cc engines and a few were powered by 'reconditioned' Honda four cylinder 1100cc or 1200cc engines. Note: Honda engines were up to 10 years old. Buyers names include: distributor... then dealer... and then first owner, then current owner/club member if known. Engines as shipped from Owosso Motor Car Co.
Pulse #072..........Year August 6, 1985....Red.....Rose Marine...Robert Dozier - Odessa, TX...Mr. Sherman of Odessa, TX. Pulse #093.....Blue.....Year 1985........Rose Marine....Mile High Pulse - Paul Teggart - Thornton or Lakewood, CO...Steve Warren Denver -CO.
Pulse #103..........Year 1985....Silver....Unknown/NY/Dewayne Dickey...Houston, Texas. Pulse #120..........Year 1985....Silver....James Griffis/Howard Cook........Gary Ries of MN. Somewhere between #142 and #147, OMCC switched from coil-over shocks to air shocks. 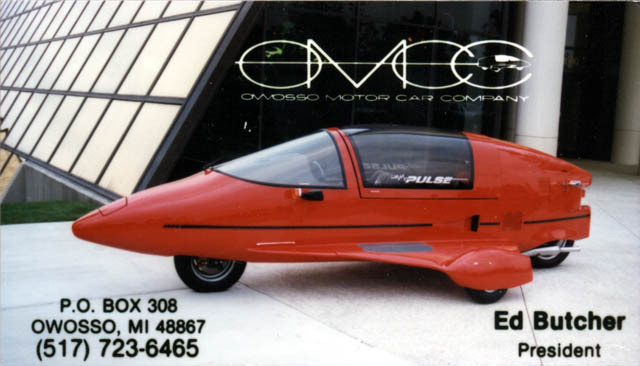 Owosso Motor Car Company changed its headlight configuration (after Pulse #178) from dual headlights to a single retractable pop-up headlight from a 1984-1985 Pontiac Fiero. The Pulse buyer was never given a headlght choice. Pulse #204..........Year March 1986...Yellow....."Dr. Jack" Chiropractor - Merietta, GA.....Bob Raven........ Trish and Lyle - Canton GA......Dezer Collection - North Miami, FL.....Charles R. Nelson of Walla Walla, WA. The following Pulse bodies were manufactured by a Fowler, Michigan company. These bodies are injection molded and the material is thinner than those produced by Nero Plastics of Owosso, MI. Pulse #252..........Year July 1986........White.....Howard Beaver - IL.....Tom Canfield - Madison, WI. OMCC files Chapter 11 in June 1986 and company moves to Ed Butcher's farm north of Corunna. Pulse #253..........Year August 1986........White......Prairie Cycles - IL..........Bill Folkenroth Washington, Il. Buyer unhappy buying new vehicle with 8 year old engine. Body Number.....Spring of 1986 ? Pulse #281..........Year August 1987...Red.....Naples Auto Sales - NJ....James Bethel......Dean Nichols - N.J.
Pulse #311..........Year Oct. 1988....Red....Debbie Hull CA/Vaughn L. Crispin, Jr.
Pulse #313..........Year 1988........Yellow......Craig Heavenridge IN. Pulse #321..........Year Jan. 1989.....Silver....Coors Silver Bullet.....Lee Buxton....Unknown...N.H. Pulse #322..........Year 1989........Red.....Clay Holland.......Chip Pierce - Maylene, AL .........? Pulse #323..........Year 1989.....Red...........Bill Kelley - Goreville, IL.....Chip Pearce - Maylene, AL... ....Doug Minert - Portage, MI.....Unknown MS.
All other names are former owners or DEALERS. Dealers will be in BOLD print. Coker, Harold..............................Chattanooga, TN...............Scranton Litestar # ? Gaydis, Ron..................................Mineral Point, PA..................Pulse #? Laszlo Car Wash.....Pulse eastern Regional....................Flushing (Queens), N.Y. ........................Pulse #223 ??? Pulse Eastern Regional......Laszlo Car Wash.....................Flushing (Queens), N.Y. ........................Pulse #223 ??? Flushing (Queens)..............................Laszlo Car Wash - Pulse Eastern Regional..................Pulse #223 ?? Chattanooga............................Harold Coker............Scranton Litestar # ?